Located 5 Miles Northwest of The Loop. Logan Square refers to both one of the 77 city-designated community areas as well as a smaller neighborhood located within that community area on the northwest side. The Logan Square neighborhood is centered on the public square that serves as its namesake, located at the three-way intersection of Milwaukee Avenue, Logan Boulevard and Kedzie Boulevard. The community area of Logan Square is, in general, bounded by the Metra/Milwaukee District North Line railroad on the west, the North Branch of the Chicago River on the east, Diversey Avenue, on the north, and Bloomingdale Avenue on the south. The area is characterized by the prominent historical boulevards, stately greystones and large bungalow-style homes. The community area and neighborhood are named for General John A. Logan who served in the Civil War, and later in Congress. One of the most striking intersections in the city, the square itself is a large public green space formed as the grand northwest terminus of the Chicago Boulevard System and the junction of Kedzie and Logan Boulevards and Milwaukee Avenue, which was once known as “Northwest Plank Road” and traces its origins back to a Native American trail, prior to 1830. 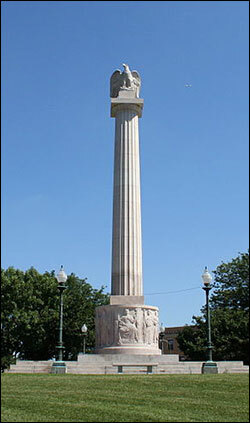 At the center of the square, known as Logan Square is the Illinois Centennial Monument, built in 1918 to commemorate the 100th anniversary of Illinois’ statehood. The monument, designed by Henry Bacon, famed architect of the Lincoln Memorial in Washington, DC and sculpted by Evelyn Longman, is a single 70-foot tall Tennessee-pink marble Doric column, based upon the same proportions as the columns of the Parthenon in Ancient Greece, and topped by an eagle, in reference to the state flag and symbol of the state and the nation. Belmont Gardens spans the Chicago Community Areas of Logan Square and Avondale like neighboring Kosciuszko Park, located within its northwest portion, where the Pulaski Industrial Corridor abuts these residential areas. The boundaries of Belmont Gardens are generally held to be Pulaski Road to the East, the Union Pacific/Northwest rail line to the West, Belmont Avenue to the North, and Fullerton Avenue to the South. Most of the land between Fullerton Avenue and Diversey Avenue as well as Kimball Avenue to the Union Pacific/Northwest rail line was empty as late as the 1880s, mostly consisting of the rural “truck farms” that peppered much of Jefferson Township. This began to change with the annexation of this rustic hinterland to the city in 1889 in anticipation of the World’s Columbian Exposition that would focus the country’s eyes on Chicago just a few years later in 1893. Belmont Gardens’s first urban development began thanks to Homer Pennock, who founded the industrial village of Pennock, Illinois. Centered on Wrightwood Avenue, which was originally laid out as “Pennock Boulevard”, was planned to be a hefty industrial and residential district. The development was so renowned that the village was highlighted in a “History of Cook County, Illinois” authored by Weston Arthur Goodspeed and Daniel David Healy. Thwarted by circumstances as well as the decline of Homer Pennock’s fortune, this district declined to the point that the Chicago Tribune wrote about the neighborhood in an article titled “A Deserted Village in Chicago” in 1903. The original name of the Healy Metra Station was originally named after this now lost settlement. While Homer Pennock’s industrial suburb failed, Chicago’s rapid expansion transformed the area’s farms into clusters of factories and homes. At the turn of the 20th century as settlement was booming, Belmont Gardens and Avondale were at the Northwestern edge of the Milwaukee Avenue “Polish Corridor”- a contiguous stretch of Polish settlement which spanned this thoroughfare all the way from Polonia Triangle at Milwaukee, Division and Ashland to Irving Park Road. Belmont gardens offered more than just a less congested setting for its new residents. Due to its proximity to rail along the Chicago, Milwaukee, St. Paul and Pacific Railroad, the area developed a plethora of industry that still survives in the city’s Pulaski Industrial Corridor. It was adjacent to his own factory that Mr. Walter E. Olson built what the Chicago Tribune put at the top of its list of the “Seven Lost Wonders of Chicago”, the Olson Park and Waterfall Complex, a 22-acre garden and waterfall remembered by Chicagoans citywide as the place they fondly reminisce heading out to for family trips on the weekend. The ambitious project took 200 workers more than six months to fashion it out of 800 tons of stone and 800 yards of soil. Latino settlement in the neighborhood began in the 1980s. Today the area still retains its blue collar feel as much of surrounding Logan Square and Avondale undergo increased gentrification. Bucktown is a neighborhood located in the east of the Logan Square community area in Chicago, directly north of Wicker Park, and northwest of the Loop. Bucktown gets its name from the large number of goats raised in the neighborhood during the 19th century when it was an integral part of the city’s famed Polish Downtown. The original Polish term for the neighborhood was Kozie Prery (Goat Prairie). Its boundaries are Fullerton Ave. to the north, Western Ave. to the west, Bloomingdale Avenue. to the south, and the Kennedy Expressway to the east. Bucktown’s original boundaries were Fullerton Avenue, Damen Avenue (f/k/a Robey Street), Armitage Avenue and Western Avenue. Bucktown is primarily residential, with a mix of older single family homes, new builds with edgy architecture, and converted industrial loft spaces. Horween Leather Company has been on North Elston Avenue in Bucktown since 1920. The neighborhood’s origins are rooted in the Polish working class, which first began to settle in the area in the 1830s. A large influx of Germans began in 1848 and in 1854 led to the establishment of the town of Holstein, which was eventually annexed into Chicago in 1863. In the 1890s and 1900s, immigration from Poland, the annexation of Jefferson Township into Chicago and the completion of the Logan Square Branch of the Metropolitan Elevated Lines contributed to the rapid increase in Bucktown’s population density. Three of the city’s most opulent churches designed in the so-called ‘Polish Cathedral style’- St. Hedwig’s, the former Cathedral of All Saints and St. Mary of the Angels date from this era. The early Polish settlers had originally designated many of Bucktown’s streets with names significant to their people – Kosciusko, Sobieski, Pulaski and Leipzig (after the Battle of Leipzig). Chicago’s City Council, prompted by a Bucktown-based German contingent with political clout, changed these Polish-sounding names in 1895 and 1913. In its place the new names for these thoroughfares bore a distinct Teutonic hue – Hamburg, Frankfort, Berlin and Holstein. Anti-German sentiment during World War I brought about another name-change that left today’s very Anglo-Saxon sounding names: McLean, Shakespeare, Charleston, and Palmer. Polish immigration into the area accelerated during and after World War II when as many as 150,000 Poles are estimated to have arrived in Polish Downtown between 1939 and ’59 as Displaced Persons. Like the Ukrainians in nearby Ukrainian Village, they clustered in established ethnic enclaves like this one that offered shops, restaurants, and banks where people spoke their language. Milwaukee Avenue was the anchor of the city’s “Polish Corridor”, a contiguous area of Polish settlement that extended from Polonia Triangle to Avondale’s Polish Village. Additional population influxes into the area at this time included European Jews and Belarusians. Latino migration to the area began in the 1960s with the arrival of Cuban, Puerto Rican, and later Mexican immigrants. Puerto Ricans in particular concentrated in the areas along Damen and Milwaukee Avenues through the 1980s after being displaced by the gentrification of Lincoln Park that started in the 1960s. The local Puerto Rican community lent heavy support for the Young Lords and other groups that participated in Harold Washington’s victorious mayoral campaign. In the last quarter of the 20th century, a growing artists’ community led directly to widespread gentrification, which brought in a large population of young professionals. In recent years, many trendy taverns and restaurants have opened in the neighborhood. There also have been a considerable number of “teardowns” of older housing stock, often followed by the construction of larger, upscale residential buildings. Kosciuszko Park (correctly pronounced “Ko-shchoosh-coe” in Polish, or “Koz-eeh-es-coe” to most residents) spans the Chicago Community Areas of Logan Square and Avondale like neighboring Belmont Gardens, located within its northwest portion, where the Pulaski Industrial Corridor abuts these residential areas. Colloquially known by locals as “Koz Park”, or even the “Land of Koz”, the area is a prime example of a local identity born thanks to the green spaces created by Chicago’s civic leaders of the Progressive Era. The boundaries of Kosciuszko Park are generally held to be Central Park Avenue to the East, Pulaski Road to the West, George Street to the North, and Altgeld to the South. Most of the land between Fullerton Avenue and Diversey Avenue as well as Kimball Avenue to Pulaski Road was empty as late as the 1880s, mostly consisting of the rural “truck farms” that peppered much of Jefferson Township. This began to change with the annexation of this rustic hinterland to the city in 1889 in anticipation of the World’s Columbian Exposition that would focus the country’s eyes on Chicago just a few years later in 1893. Kosciuszko Park’s first urban development began thanks to Homer Pennock, who founded the industrial village of Pennock, Illinois. Centered on Wrightwood Avenue, which was originally laid out as “Pennock Boulevard”, was planned to be a hefty industrial and residential district. The development was so renowned that the village was highlighted in a “History of Cook County, Illinois” authored by Weston Arthur Goodspeed and Daniel David Healy. Thwarted by circumstances as well as the decline of Homer Pennock’s fortune, this district declined to the point that the Chicago Tribune wrote about the neighborhood in an article titled “A Deserted Village in Chicago” in 1903. Kosciuszko Park offered more than just a less congested setting for its new residents. Due to its proximity to rail along the Chicago, Milwaukee, St. Paul and Pacific Railroad, the area developed a plethora of industry that still survives in the city’s Pulaski Industrial Corridor. Adjacent to Kosciuszko Park’s border with Avondale proper near the intersection of George Street and Lawndale Avenue is St. Hyacinth Basilica, which began in 1894 as a refuge for locals to tend to their spiritual needs. A shrine, St. Hyacinth’s features relics associated with Pope John Paul II, as well as an icon with an ornate jeweled crown that was blessed by the late pontiff. Other institutions further enriched the institutional fabric of the Polish community in the area. In 1897, the Polish Franciscan Sisters began building an expansive complex on Schubert and Hamlin Avenues with the construction of St. Joseph Home for the Aged and Crippled, a structure that would also serve as the motherhouse for the order. When it opened in 1898, it became the city’s first and oldest Catholic nursing home. One of the industries the nuns took upon themselves to support these charitable activities was a church vestment workshop which opened in 1909 on the second floor. Many of these Polish nuns were expert seamstresses, having learned these skills in the Old World. In 1928 the Franciscan Sisters further expanded the complex by building a new St. Joseph Home of Chicago, a structure that stood until recently at 2650 North Ridgeway. Designed by the distinguished firm of Slupkowski and Piontek who built many of the most prestigious commissions in Chicago’s Polish community such as the Art Deco headquarters of the Polish National Alliance, the brick structure was an imposing edifice. One of the building’s highlights was a lovely chapel with a masterfully crafted altar that was dedicated to the Black Madonna. The entire complex was sold to a developer who subsequently razed the entire complex, while the new “St. Joseph Village” opened in 2005 on the site of the former Madonna High School and now operates at 4021 W. Belmont Avenue. The park later became home to one of the two first Polish language Saturday schools in Chicago. While the school has since moved out of their small quarters at the park fieldhouse, the Tadeusz Kościuszko School of Polish Language continues to educate over 1,000 students to the present day, reminding all of its origins in Kosciuszko Park with its name. It was the park of Kosciuszko Park however that weaved together the disparate subdivisions and people into one community. Dedicated in 1916, Kosciuszko Park owes its name to the Polish patriot Tadeusz Kosciuszko. Best known as the designer and builder of West Point, Kosciuszko fought in the American Revolution and was awarded with U.S. citizenship and the rank of brigadier general as a reward. Kosciuszko was one of the original parks of the Northwest Park District which was established in 1911. One of the ambitious goals of the Northwest Park District that was in keeping with the spirit of the Progressive Movement popular at the time was to provide one park for each of the ten square miles under its jurisdiction. Beginning in 1914, the district began to purchase land for what would eventually become Mozart, Kelyvn, and Kosciuszko Parks, and improvement on these three sites began almost immediately. For Kosciuszko, noted architect Albert A. Schwartz designed a Tudor revival-style fieldhouse, expanded in 1936 to include an assembly hall, just two years after the 22 separate park districts were consolidated into the Chicago Park District. The park complex expanded during the 1980s with the addition of a new natatorium at the corner of Diversey and Avers. The green space afforded by the park quickly became the backdrop for community gatherings. Residents utilized the grounds at Kosciuszko Park for bonfires, festivals and neighborhood celebrations, and for a time, even an ice skating rink that would be set up every winter. Summertime brought the opportunity for outdoor festivities, peppered with sports and amateur shows featuring softball games, social dancing, a music appreciation hour, and the occasional visit by the city’s “mobile zoo”. Today “The Land of Koz” is a diverse neighborhood, and becoming even more so as gentrification advances further northwest. New people are entering Kosciuszko Park and joining earlier residents whose roots trace back to Latin America and Poland. Yet the park that lent the neighborhood its name still serves its residents, where through play, performance, and even the occasional outdoor film screening it functions as the venue where the community can come together. Logan Square is a neighborhood located in the north-central portion of the Logan Square community area in Chicago. The neighborhood of Logan Square was originally held to be Kimball Avenue on the west, California Avenue to the east, Diversey Avenue, on the north, and Fullerton Avenue to the south. However, as memory of the village and later neighborhood of Maplewood has receded, the eastern boundary has now shifted to the North Branch of the Chicago River. The area is characterized by the prominent historical boulevards and large bungalow-style homes. At one time, Logan Square boasted a large Norwegian-American population, centered along the historic boulevards. With relatively inexpensive housing and rent available, this neighborhood was a favorite for immigrants and working-class citizens. Logan Square was the site of the Norwegian-American cultural center, Chicago Norske Klub. Many elaborate, stylish, and expensive houses and mansions line historic Logan(2600 N) and Kedzie Boulevards where the club was once situated. Norwegian Lutheran Memorial Church, also known as Minnekirken, is also located on Kedzie Boulevard in Logan Square. The Palmer Square neighborhood of Chicago is a pocket neighborhood located within Logan Square. Although there is no clear consensus on this neighborhood’s exact boundaries, the City of Chicago Neighborhoods Map shows that it is generally bound by Fullerton Avenue (2400 N) to the north, Armitage Avenue (2000 N) to the south, Kedzie Boulevard (3200 W) to the west, and Milwaukee Avenue (~2400–2800 W) to the east. The neighborhood’s name originates from the large 7-acre (28,000 m2) Palmer Square Park (pictured to the left) that sits near the western edge of the neighborhood. New Belgium Brewing Company’s Tour de Fat takes place in Palmer Square Park every summer. The City of Chicago in 2005 received a matching grant from the Illinois Department of Natural Resources to develop a children’s play space, walking trails, soft surface jogging trail, open lawn areas, lighting, seating, and landscaping in Palmer Square. After extensive community input and prolonged design and construction periods, the Chicago Park District (CPD) finished construction of the park and opened it to the public in July 2009. Palmer Square neighborhood’s vibrant character, bustling business corridors, and charming tree-lined streets make it a popular neighborhood for a diverse group of individuals and families. Its location is directly west of Bucktown, north of Humboldt Park, and northwest of Wicker Park, and places its residents within walking distance to a number of shops, coffee houses, bars, and restaurants. Easy access to the highways and the public transportation system also makes Logan Square a popular neighborhood for commuters who work in Chicago’s Loop or for students who attend colleges nearby or downtown. The neighborhood is just west of the Kennedy Expressway (routes 90/94) and near the California and Western stops of the CTA’s Blue Line for a quick ride to Chicago’s downtown and O’Hare International Airport. The CTA’s bus routes #52 (California), #56 (Milwaukee), #73 (Armitage), and #74 (Fullerton) also run through this neighborhood.